And what's more -- I didn't finish a single quilt this month! The only thing I finished was my "Sew Together" bag! Oh, yeah -- and the dress I wore to a friend's wedding on Saturday. 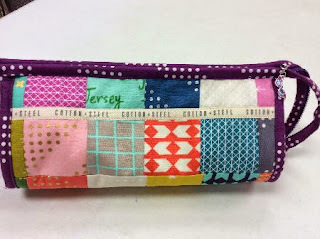 I also finished a "test sew" bag for Sew Sweetness, but you'll have to wait to see that! Luckily, other UFO challengers did better than me this month. 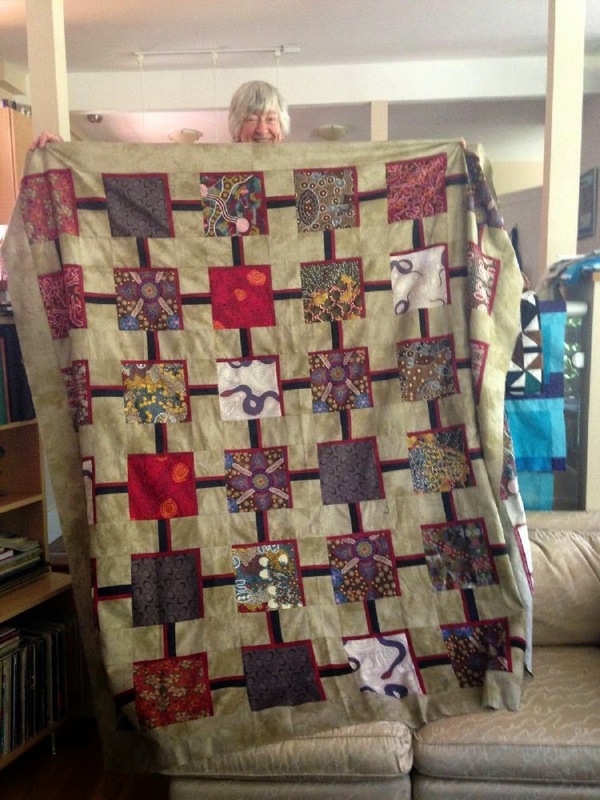 Sandi made up for me by finishing TWO quilts this month. 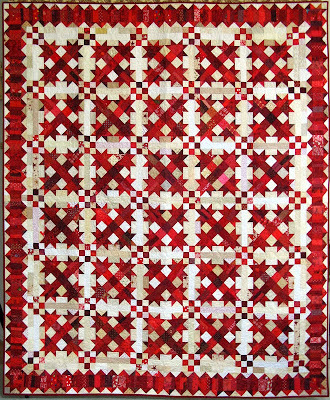 First, from the incredible Bonnie Hunter of Quiltville, "Kranberries." It finished at 84" X 97" and I love it love it love it! Check out the details at KwiltnKats, here. Sandi also finished "Kings," aka "Playing with Jacks." This one is only 31" X 33", I might be more likely to finish this one! Lucky Sandi will get to meet Bonnie when Bonnie visits Southern California in October. More details about "Kings" here. Debra has three finishes for August. First, from Idahoan Kim Diehl, "Scrap Blossoms." 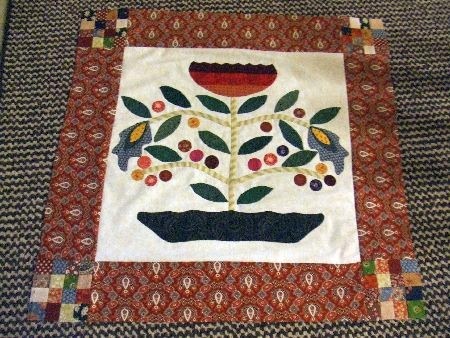 Whenever I see such a gorgeous applique' project, I think, "I should learn to do that." Ahh. No. 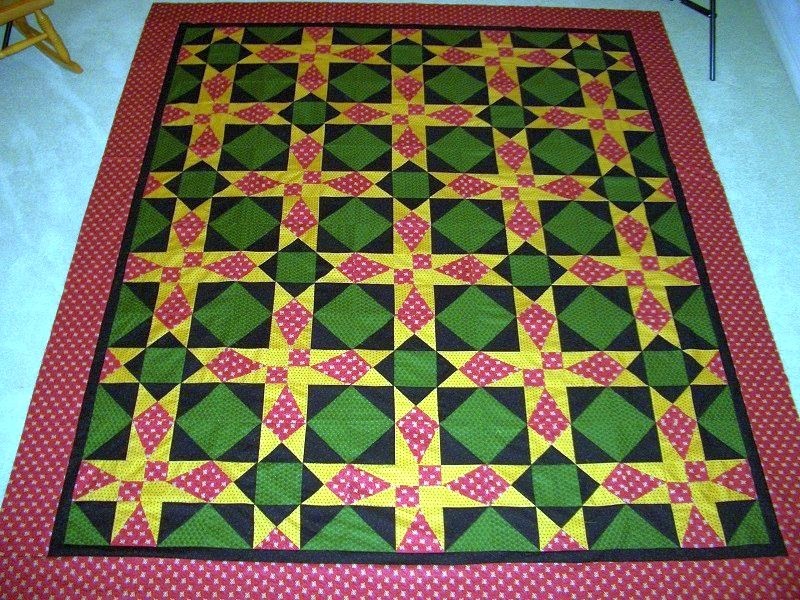 Inspired by her 2013 "finish," Debra also whipped up this 94 1/2" square beauty from the most recent Quiltmaker magazine. It's called "Irish Stars," and Deb -- it's gorgeous, even if you DID have to do the frog dance (rip it, rip it, rip it) on the last two rows! Be sure to notice the supervisor in the upper left-hand corner! I tried, tried, tried but with six Chihuahua's (dog sitting) running all over the place I was able to get approx. 75% of my quilt done. I'd get a row laid out, get the box to start another, lay out another and back to square one (literally) it was. I did try but this body finally gave up the "dog fight". As you can see, this quilt is too big for the photo! Congrats on your "finally finish," Debra! Just in case you don't have enough UFOs, here is the link to the Friends & Companions site. Isn't it gorgeous? I think this one is a "true transparency" quilt! Dang! 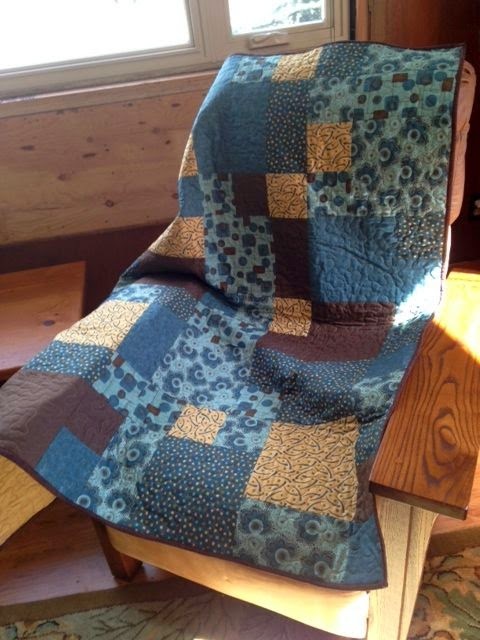 Martha also finished three quilts this month! You guys are making me feel like a slacker! This one is so fun, it's all Australian fabrics with snakes, for her brother-in-law. Lucky guy, I bet he will love it, Martha! Her third quilt is for a vet at the Idaho State Veterans' Home in Boise. Martha, some Idaho veteran is going to love this. 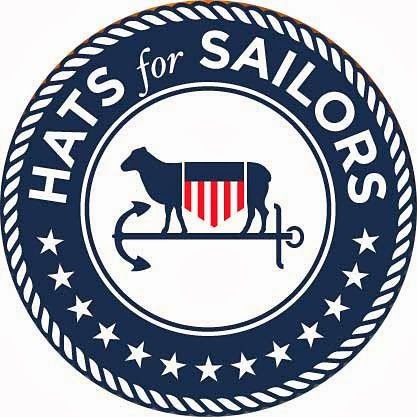 Thank you for supporting our vets! 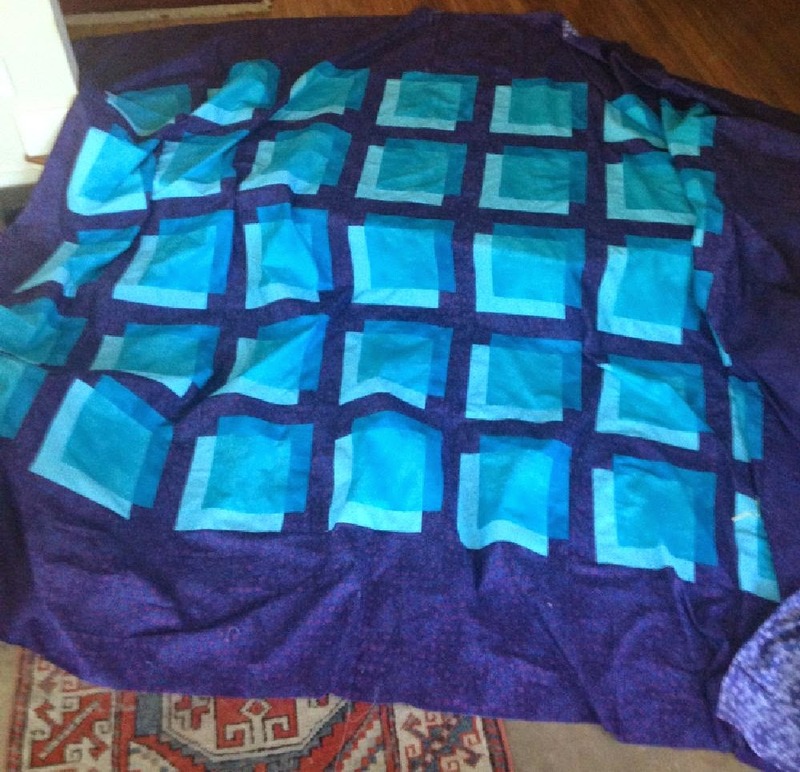 Mary also finished a charity quilt. This one will go to the Ronald McDonald house -- I think the colors will be great for a child, Mary! 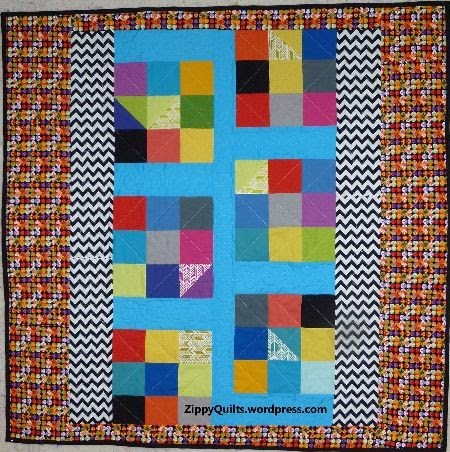 Mary used orphan blocks to kick of this colorful quilt. Details on her blog, Zippy Quilts, here. 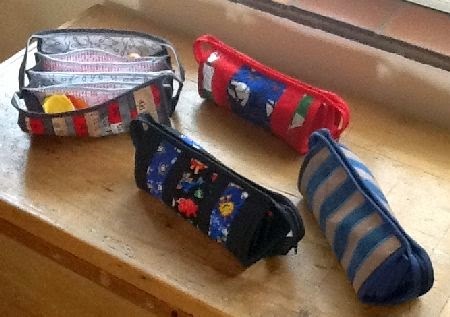 Gill in the UK caught the "Sew Together Bag" bug and made not one, but FOUR STBs this month! Her son even wanted one -- aren't the the most fun? 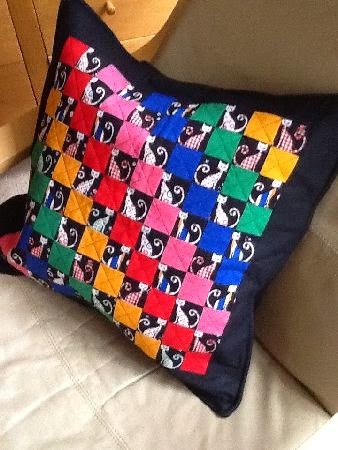 Gill's "drawn number" was this darling kitty cat cushion for her Mum.
. . . finished just in time as she was on the aeroplane from Australia for her annual visit!! The reason this project stalled (it was her birthday present last November) was because I suddenly realised that I couldn't just cut up the fabric any old how because it would mean decapitating cats - which I guessed wouldn't be a good thing for a present for a cat lover! So there was lots of fussy cutting involved... At least it's done and given to her now!! I'm a cat lover, too, Gill, so I'm glad you took the extra time to "save the kitties!" 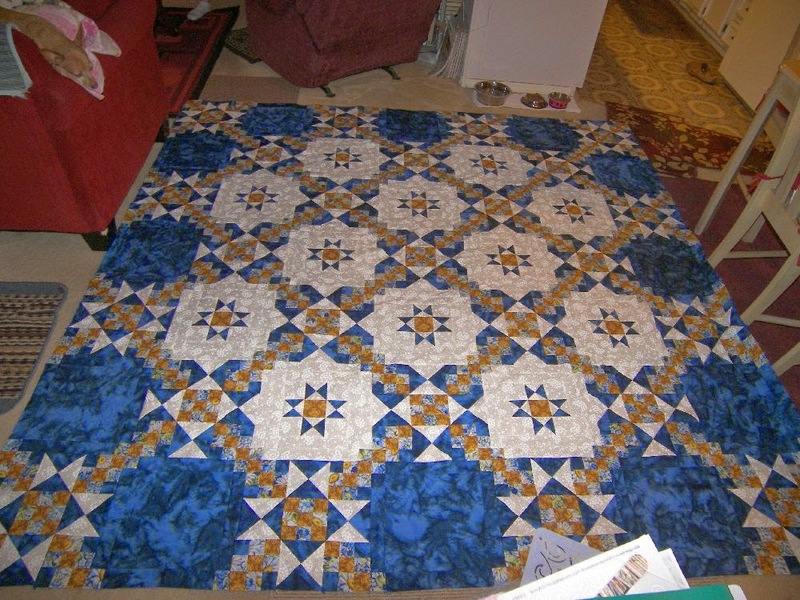 Heather finished this lovely, scrappy number -- "Frontier Foundations." 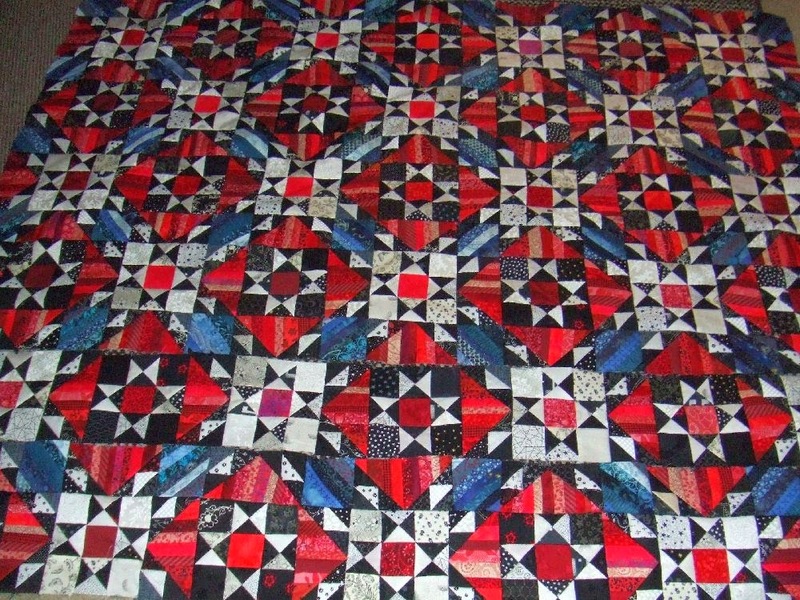 The colors in the quilt are inspired by the toile backing. 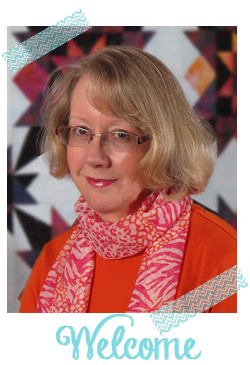 Visit Heather's blog, Peachy Pages, here to read the details. Sue's August "challenge" is really a challenge. She's working on a Mariner's Compass using instructions and tools from one of my favorite Colorado teachers, Cheryl Phillips. 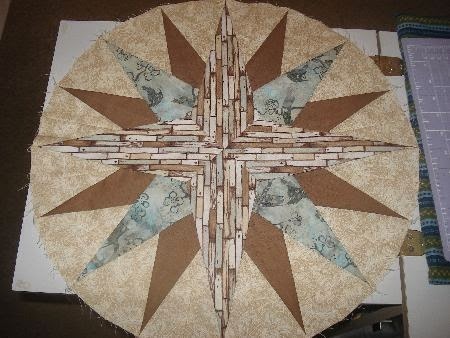 Even though her Mariner's Compass isn't quilt finished, I think she should get credit! Sue, I've made one (one!) of these, and I know what a challenge it is! 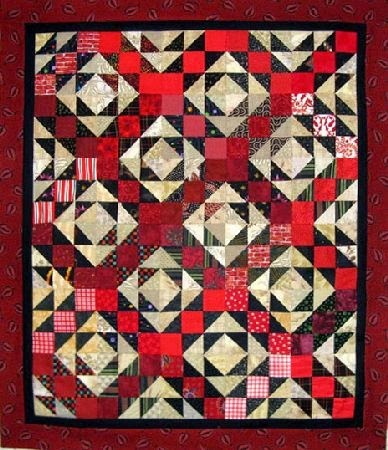 Details on Sue's Quilty Bits and Bobs, here. 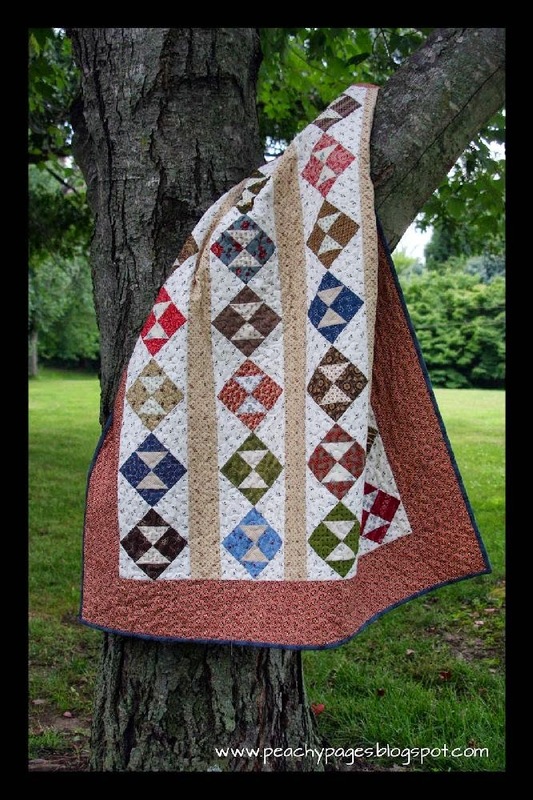 Kerry started this quilt as a mystery in a class at Road to California Quilt show in 2013. It is called "Expect the Unexpected" by Karen Sievert. 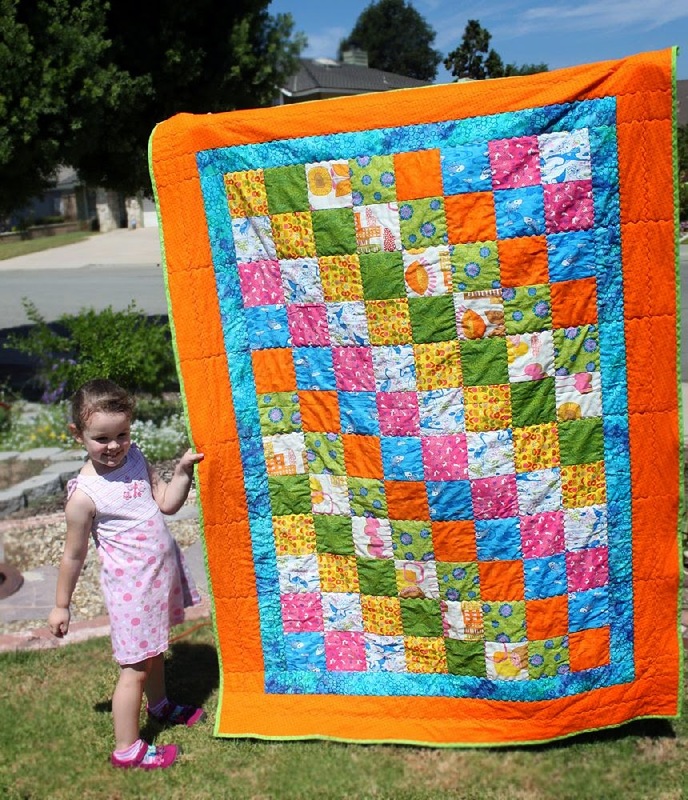 She says, "It is a very large quilt 90x104, but did go together fast once I got to it! Glad to have this one finished." I'm glad, too, Kerry! Irene is ready for the Holidays with her finish. 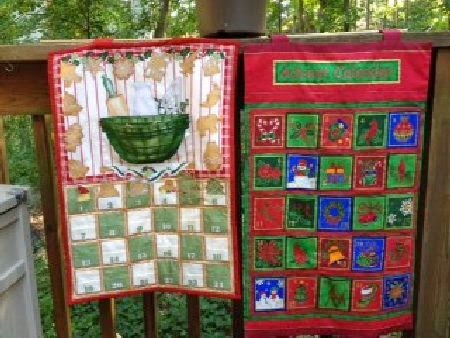 Two Advent Calendars, she says she has been working on them for five years! Woo hoo, Irene! Check out the back story at her blog, A Serendipitous Retirement, here. I love the model for Elisa's August finish! Wow! 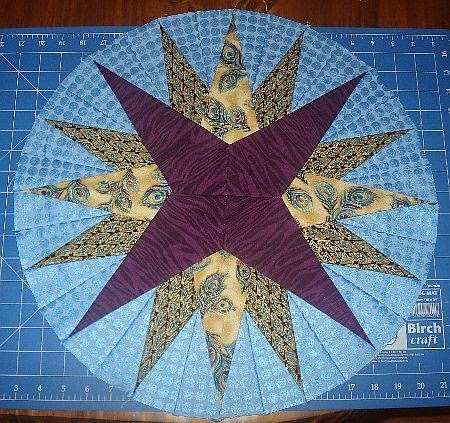 Nineteen finishes this month -- and that's not counting Deb's blocks or Sue's partial Mariner's Compasses. I thought quilters took the summer off! Mr. Random Number chose Heather as the winner for this month's Parade. Congratulations, Heather! I have a "Little Bites" pattern and some fabric candies to send you. My Little Sailor is coming home on leave from Japan very soon. 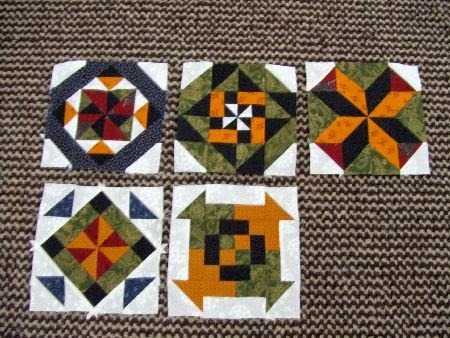 52 Quilts will be on hiatus the second half of September, and the October 1 UFO Parade will be late. But that doesn't mean we shouldn't be working on UFO #5! Send in your photos as soon as you're finished -- I'm looking forward to seeing what everyone makes in September! Wow! There are so e really great finishes this month! Thanks again for hosting this lovely UFO Parade!!! !